40 Years After Chilean Coup, Allende Aide Juan Garcés on How He Brought Pinochet to Justice | Democracy Now! former personal adviser to Chilean President Salvador Allende. Juan Garcés later led the successful legal effort to arrest General Augusto Pinochet and prosecute him for crimes against humanity in the Spanish courts. Garcés received the Right Livelihood Award in 1999. Wednesday marks the 40th anniversary of the so-called “other 9/11”: On September 11, 1973, a U.S.-backed coup led by General Augusto Pinochet ousted the democratically elected president, Salvador Allende. 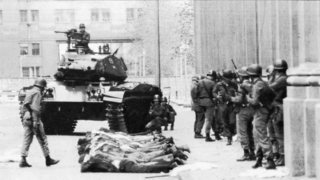 It is estimated more than 3,000 people were killed during Pinochet’s dictatorship, which lasted another 17 years. In 1998, Pinochet was arrested in London on torture and genocide charges on a warrant issued by a Spanish judge, Baltasar Garzón. His arrest came largely thanks to the efforts of our guest, Spanish attorney Juan Garcés. A personal adviser to Allende, Garcés was with him on the day of the coup. Allende walked him to the palace exit before it was bombed and told him to tell the world what he had seen. Garcés went on to lead the efforts for Pinochet to be arrested and tried. AMY GOODMAN: Singer-songwriter Víctor Jara, who was tortured and executed during the Chilean coup of Salvador Allende. September 11, 1973, the coup began. He died a few days later in or around the stadium, which is now called Víctor Jara Stadium. This is Democracy Now!, democracynow.org, The War and Peace Report . I’m Amy Goodman, with Aaron Maté. To see my interview with Joan Jara, the widow of Víctor Jara that we conducted yesterday, you can go to our website at democracynow.org, as well is with Joyce Horman, who is the widow of Charlie Horman, a young American freelance journalist who also died in those days after the coup, killed by the Pinochet forces. Aaron? AARON MATÉ: Well, we turn now to the 40th anniversary of the so-called “other 9/11,” the one that occurred in Chile on September 11th, 1973. A U.S.-backed coup led by General Augusto Pinochet ousted the democratically elected President Salvador Allende. It’s estimated over 3,000 people were killed during Pinochet’s dictatorship, which lasted a further 17 years. Today, Chile continues to grapple with Pinochet’s repressive and neoliberal legacy, and the country is the middle of an intense presidential election between two contenders with family ties to the coup. Evelyn Matthei, candidate of the right-wing Independent Democratic Union party, is the daughter of retired Air Force General Fernando Matthei, who served in Augusto Pinochet’s military junta. Her opponent is Michelle Bachelet, Chile’s Socialist Party president from 2006 to 2010. She is the daughter of another famous Air Force general, Alberto Bachelet, who was imprisoned and tortured to death for refusing to support Allende’s overthrow. Chilean human rights groups have petitioned the courts to hold General Matthei, who commanded the base where General Bachelet died, responsible for his death. AMY GOODMAN: Well, one general who did face prosecution for crimes against humanity was General Augusto Pinochet, thanks in large part to the efforts of our next guest, Juan Garcés. Garcés served as the personal adviser to President Salvador Allende. He was with him the day of the coup, September 11, 1973. Allende walked him to the palace exit before it was bombed, and told him to tell the world what he had seen. Garcés later led efforts for Pinochet to be arrested and tried. We’re also joined by Peter Kornbluh, who spearheaded the effort to declassify more than 20,000 secret documents that revealed the role of the CIA and the White House in the Chilean coup. Kornbluh is the author of the just newly published The Pinochet File: A Declassified Dossier on Atrocity and Accountability, which has been updated in a new edition that has just come out this week. Peter Kornbluh is also director of the Chile Documentation Project at the National Security Archive and has just returned from Chile. His latest piece in The Nation magazine, “Chileans Confront Their Own 9/11: Forty Years After Pinochet’s Coup, a Historic Presidential Campaign Has Revived Debates About his Dictatorship—And Washington’s Role in It.” And that’s what we’re going to talk about today. Juan Garcés, you have also published a new book simply called Allende. Talk about that day 40 years ago tomorrow, 40 years ago, September 11, 1973, when you were with President Allende in the palace. Talk about what happened. AMY GOODMAN: That extended to places like Argentina and others. JUAN GARCÉS: And the coordination between the regional services to kidnap the respective archenemies and torture them and making them disappear. And what is a matter of concern that the methods that were applied by this dictatorship against the people that was for a representative form of government, those methods you can see them working now and being applied worldwide. You have extraordinary renditions. You have extrajudicial killings. You have secret centers of detentions. AMY GOODMAN: You’re talking about the United States now? JUAN GARCÉS: I am very concerned that those methods, the habeas corpus ineffectiveness, were applied in Chile with the knowledge and the backing of the Nixon-Kissinger administration in this period. And I am very concerned that the same methods are being applied now under—in other explanations, in many countries with the backing of the United States. That is something that is—I consider as very dangerous for everyone. AMY GOODMAN: Before we continue on that path, I did want to just capture this moment 40 years ago, when you were in the palace with Salvador Allende and others of his advisers. Explain what happened next, how he died and you lived. JUAN GARCÉS: Well, I worked with President Allende the night before the coup. And I slept in his home, and I went with him to the presidential palace, because this was the day in which the president will address a message to the nation, opening—calling for a referendum where the citizens will, in their box, decide which future they were preferring: the one that was proposed by the government and—or the one that was proposed by opposition in the Parliament. So, the referendum was open. And in place—and then we were preparing this message to the nation. And in the time that the message should be sent to the airwaves, through the TV, in place of that, there was the attack by airplanes, by artillery, by infantry, with the [inaudible] of killing the president. And, well, this was a political fight. At 9:00 a.m., I asked the president how—”Do you have some regiment, your side?” And the answer was, “No, no regiment.” So, in terms of—in military terms, the outcome was very clear: There were not any capability of military resistance. So, why Allende resisted still three, four hours more and decided to fight until his death, this is a political message of resistance, of a legitimate commander-in-chief of the army forces that was facing an insurrection, an act of indiscipline, and he didn’t abandon his post of command, and he faced, with the resources that he had, particularly the legitimacy, democratic legitimacy, and that he wanted to let this heritage to his people. And we are now realizing that 40 years later this legacy, this political legacy, is being taken in their hands by Chilean people. AMY GOODMAN: He took you to the palace exit? AMY GOODMAN: What did he tell you to do? JUAN GARCÉS: Well, one of the things that he told me is what you said a few moments ago, that given my very close, unique cooperation with him, I was in the measure of explaining what was the government doing during the three years in government, why we were doing what we have done, and which goal, object. And so, he considered that I was the person that could explain better what was the real meaning of this government.